Celebrate your special day and surprise your husband with this hilarious yet memorable gift item. 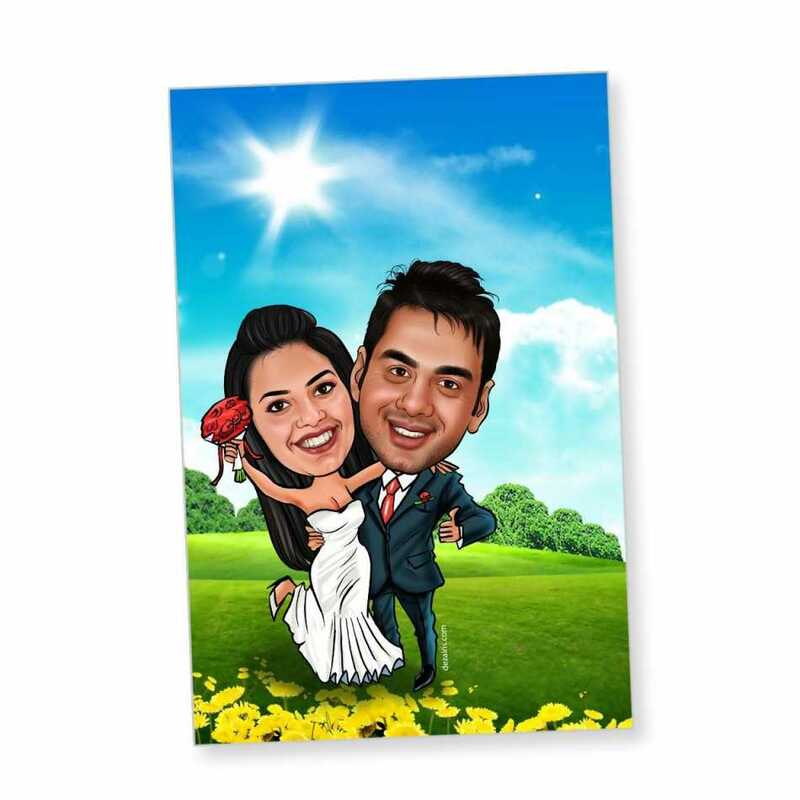 The caricature magnet features the couple_s hand drawn image in an amusing way which will surely invite some good laughs and giggles. ☞ Face in the photograph should be clearly visible: Do not send out of focus or blurred photos. The facial features should be clearly visible. A full length photo isn't preferred, as when you zoom into the face, it might become distorted. A nice closeup photograph is preferred. There is no minimum resolution needed, as along as the face is clearly visible. ☞ Its good if the subject is smiling: We request you select a photo in which the person is smiling. A photo with serious look, will result in a caricature with serious look. Our artist draws the expressions in the caricature face exactly like the photos. We can't add smile from our imagination, it won't match with the actual smile of the person. ☞ A front faced photograph is needed: The subject will be drawn exactly like the photos given. So a photograph with side looks, photos in which face is covered or incomplete isn't accepted. For best results the subject should be looking into the camera. 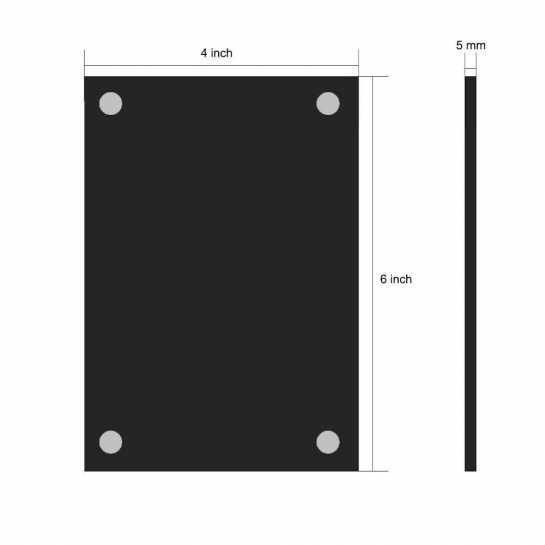 The magnets are bubble wrapped to prevent any scratches, and packaged in high density cardboard boxes, which are shipped via blue dart courier. The package can be tracked online once shipped. To create these artwork we need time. Good things cannot be done in haste, and its not a ready made product that we are selling. Once you place the order, it generally takes us two to three days to present you the first draft. Sometimes we do deliver it before depending on the work in hand. If there are any changes to be done, if will take another day to complete that. However if the changes and revisions are minor, it can be done sooner. Once the artwork is approved, we send it for printing, packaging and shipping. This process takes 1-2 days, and rest depends on the city where its being shipped to. Generally it takes 1-3 days for the shipment to reach the destination once shipped. In short the entire process takes an average of 7-8 days from placing the order to getting it delivered. Buying this product, will entitle you to be a part of 'privilege caricature group'. This means, you will get the next caricature products at discounted rate (if using the same caricature faces). To join this group and avail discount on your next orders, you could raise a request after you place your first caricature order. Q. How do I send the photos? And how do I know if its good enough for the caricature drawing? Q. Can I have a look at the caricature after the artist completes drawing it? A. Yes, we do send the artwork for approval before it is sent to production. You can review the artwork and suggest any changes if you want. The artwork will be sent to production, once you approve it. Please note that a revision will take at least 24 hours. The delivery of the product may get delayed than expected date of delivery depending on the changes required. Q. What if the caricature doesn't satisfactorily resemble the person? A. The artists at dezains.com are skilled professionals, and they have been drawing caricature for years. The caricature will resemble (facial expressions, pose etc) with the photo that you provide while ordering for making the caricature. You may suggest changes that you feel are necessary for better resemblance of the caricature. However, please note that this is a caricature and not a portrait and hence it cannot be 100% similar to the photo. Normally a resemblance of 80-85% is expected. Q. What if the caricature doesn't resemble satisfactorily, even after revisions and I want to cancel the order? A. Sorry, but we do not modify our themes. Few very minor changes can be done, but requesting changes in the dresses, backgrounds, pose etc will not be entertained. If you need to customize your own theme, you can go for the Caricature Poster that we offer. Q. Do I also get a high resolution copy of the caricature artwork? A. Yes. You can use the soft copy at a later time as per your need. We would be sending you a high resolution copy on request.